I will be the first to recognise the irony (nay! the naïveté) in the title of my first zoo world post, “good riddance.” It would be good, indeed, to bid this brightly-coloured propaganda mill “adieu” and return to commentary on the latest pulchritudinous pics targeting me, a 27 year old male, on facebook. Alas, the buxom beauties must wait for another day, for I would be remiss to ignore my journalistic duty. As they teach us in J-school: duty before booty. SUCH FAITHFUL REPRODUCTION CANNOT BE COINCIDENCE! If the monumental significance of this parallel still eludes you, do not be ashamed. It took me some time to unravel the meaning for myself. My next post will make it all come clear. 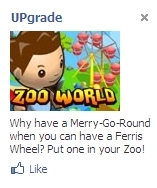 This entry was posted in facebook ads, zoo world, zw2: reign czech and tagged austria-hungary, franz joseph I, franz joseph II, kaiser wheel, zoo world by Hank. Bookmark the permalink.